As part of any creative process, there are a lot of abandoned avenues and choices. When a final design concept is approved, all other art is shelved and a final creation guided from approved art. It is an evolution, sometimes directed, and occasionally as a last resort. For television work especially, design and manufacture of these creations happens under a very tight timeline. The TNT series Falling Skies was no different in this regard, and several concept artists (Neville Page, and Aaron Sims among them) contributed. As Digital Makeup Supervisor for this show, I also had some opportunity to throw in on design ideas. Design work is a lot of fun, because it is full of possibility. 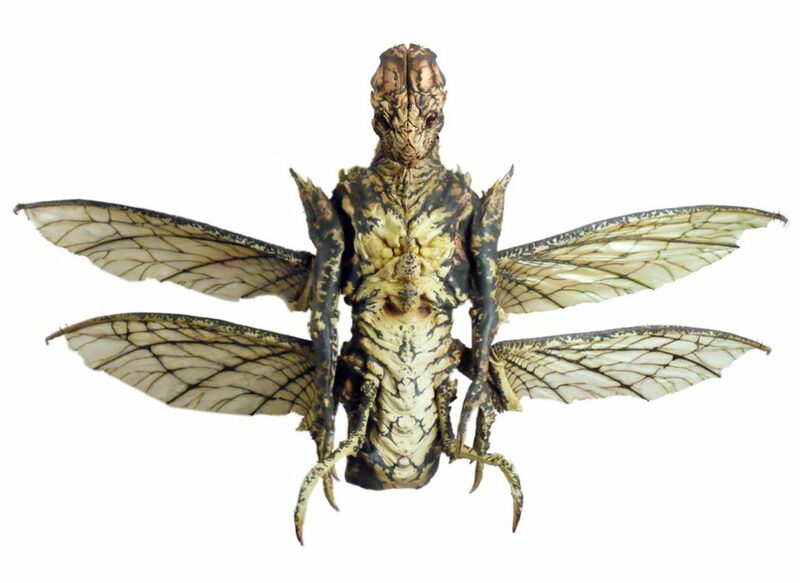 The fourth season of Falling Skies introduced several new characters, including some which used the new digital makeup pipeline we designed: new Volm, hybrid skitter-humans, and “Black Hornets” to name a few. It was a rapid fire back and forth design process spanning two countries. An eye design by one artist could quickly show up in all subsequent work of the other artists, as the challenges were resolved. Werner Pretorius, in particular, was instrumental in pushing many concepts forward with fantastic Photoshop paintings. I also did a few Photoshop illustrations, but quickly moved into zBrush sculpts to roughly flesh out lighting and form. It was a fantastic creative experience for everyone involved! New Volm warriors were introduced as a strike team working with Cochise. This work was quickly cobbled together in Adobe Photoshop. More refined work was not requested. A) “Shaq” the new warrior Volm. With a scar from a skitter battle, and ritualistic markings on the chin. This was a reworked photo of Cochise. B) Shaq needed a new warrior garb, and this quick sketch, although not used, was very similar to what other designers did for the basic Volm costume. C) What makes a Volm work? Musculature based on the idea that the Volm were once aquatic creatures. D) Multiple costume designs for Shaq, mixed modern military with hand-combat styles. The design on the left was selected — it was the last one drawn. E) The final armor/costume made up of tires, license plates, and other found objects. Built at MastersFX Vancouver. Lucky the actor (John DeSantos) was big and strong. 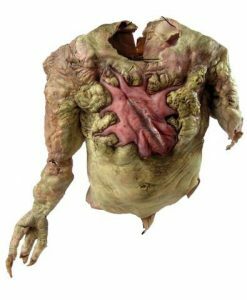 The Espheni Overlords (the bad guys in the series) used bio technology to mutate and dominate existing lifeforms on conquered worlds. In this instance their plan was to create a mix between six-legged Skitters, and humans. One of the lead characters daughters was unfortunate enough to be mutated. F) The first logical step was to take the face of the actress, and mutate forms to suggest the creature, while still maintaining recognizable features. G) A radioactive slime version of the Skitter hybrid, with a bolder color palette. I) What would a full costume look like on a performer? How to accommodate six lower limbs? This was one idea that would come back around – for a future article. Drawn with an archaic device called a pencil. J) Moving to zBrush, over a scan of a real person, quickly building-up forms in another direction. The challenge here was to see a construction on top of a person who is not the standard over-slender suit performer. These concepts were not part of the final design. The final creature was portrayed by an actress in makeup built by MastersFX, and a Computer Rendered puppet from another studio. It was only seen briefly, despite all the work that went into building it. One interesting thing to note is the similarity of the final product with the first designs, as other artists solved the same problem. Unfortunately there was no cool radioactive slime. K) The actress in final makeup (image intensity boosted 200%). It was very dark in the episode, which made it hard to see. L) The body suit for the actress (seen at auction). Update: I found a video showing the makeup on the set. It looks very similar to my original sketches, though it is likely another designer at work. Form follows function after all. Laci in Mutant makeup on set. More hybrid technology teaches the six-legged skitters how to fly. This was the one design that excited everyone, especially since there was so little time to do so. The concept went in so many directions that it resulted in an even shorter time to build the final product. In the fourth season it was briefly seen as a CGI puppet, with slight costume interaction. The final season used the creatures for many storylines, but were predominantly CGI. M) It was important to keep the dimensions of an actor in mind while designing. 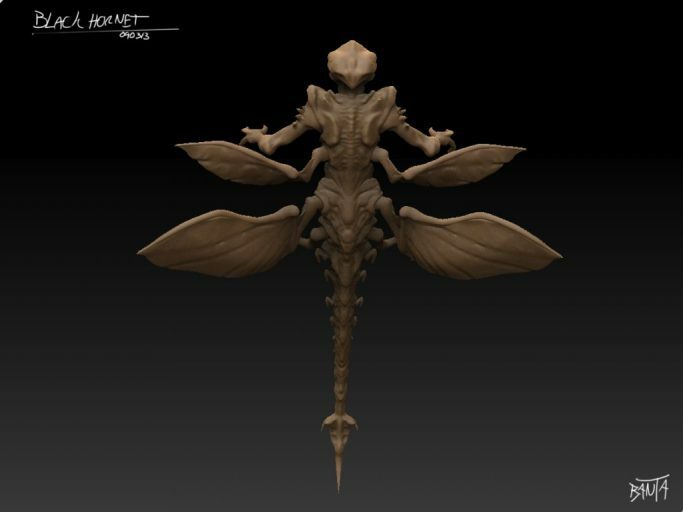 zBrush allowed the design to evolve on top of a human form. Multiple wings were used to break up the silhouette, along with obvious bat-like shapes. O) Riffing off the Pretorius design: Pencil, colored pencil, and digital finish — printed out and drawn on with ball-point pen. P) Scrambling to redesign the creature, introducing the odd foot pads from the previous drawing. Seed pods inspired the winglets on the arms. 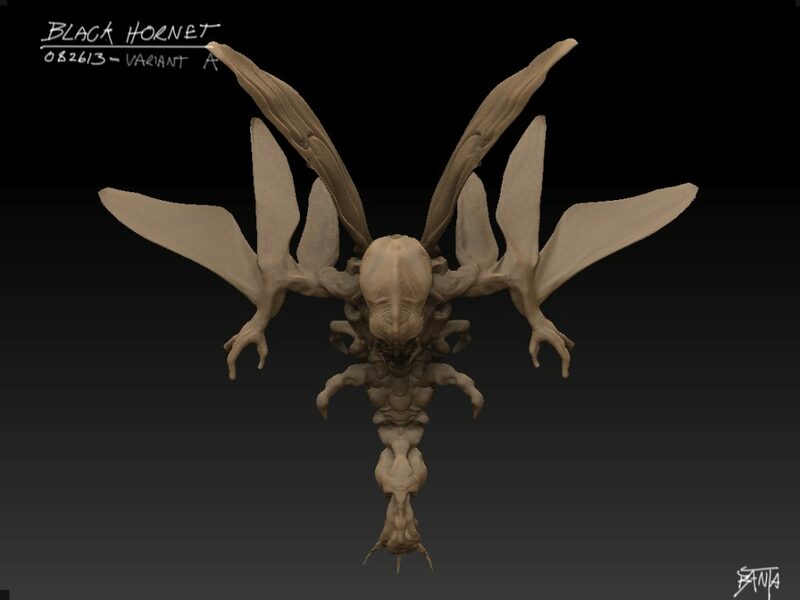 Q) Re-using the tail section from the bat-like design, and introducing hard carapace wings. R) This design was heralded, but ultimately rejected. S) A sculpted variation on the final skitter designed by Werner Pretorius. The photoshop illustrations were phenomenal, but people needed to see the forms in 3D, so this sculpt was built and posed. T) The script called for an extra set of pincers. This design suggested another form that would only be visible during feeding. Physical maquettes are great to turn-over in your hands and examine. Concept art is great for setting tone, but form is hard to understand in a 2D drawing or render. Since very few physical maquette are built anymore, a rendered or filmed turntable is used to let the client address the design. In this case we made sure that turntable was in stereo3D Anaglyph, so anyone with the proper 3D glasses could truly understand the form of the virtual maquette. Grab your own glasses and take a look. One of the main types of clay used for sculpting creatures in makeup effects is called WED clay. It is a water-based gray substance that is easily manipulated by hand. With that substance in mind, Andre Bustanoby tested some early sculpts using Modo in a virtual recreation of the shop at MastersFX. An interesting exercise to bring the physical and digital teams together. Below is the final costume worn by Keith Arbuthnot seen at auction, built by MastersFX team in Vancouver. The Animatronic head was a marvel of engineering, but ultimately played no role in any close-up shots — which was a real tragedy. Creature and concept design is what every 14-year old monster maker dreams of. It was a blast to let my 14-year old imagination out for a walk. All the design work was under the direction of Todd Masters, and final concepts are a conglomeration of many artists (whose work is mostly not pictured here). What is represented are a few of the illustrations that came from my “brush.” Some are my outright concepts, others are illustrations of other artists designs as zBrush sculpts. A retrospective of this art would be a fantastic addition to any bookshelf about the Sci-Fi genre. No such book is planned. These are some of the Lost Concepts of Falling Skies.